The Rabbit Hash Historical Society (RHHS) is the trustee and owner of Rabbit Hash, Kentucky. RHHS purchased the historic town of Rabbit Hash through a generous endowment from deceased resident, Edna Flowers in 2002. It is our mission to preserve the history and buildings of Rabbit Hash. In addition: We are the only city in the country with a canine mayor- Mayor Lucy Lou! Undertook a program of general repairs to big barn just down from the General Store. 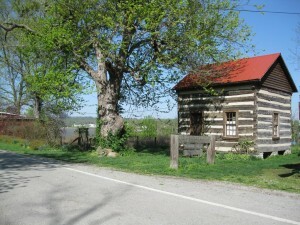 The Rabbit Hash Historical Society operates a small visitor center in a restored log cabin. The visitor center was dedicated in 1992 and is open for several hours most Saturday afternoons and by appointment. RHHS curates a range of materials relative to Rabbit Hash, including photographs of the General Store and other structures, family photos/files, prehistoric and historic artifacts, documents, books on Ohio River history, and floods. The Rabbit Hash Historical Society relies exclusively on the support of volunteers. The RHHS is all volunteer and the visitor center is staffed by a volunteer docent who is available for tours of the town. In the past two years alone, tours have been given to the following groups: Cincinnati Museum Center, elder hostel, British travel writers, local women’s clubs, K-8 school groups, and high school classes. To hold regular meetings and other activities for the instruction of the members and for promotion of the purposes of the society.